Process automation companies are currently the eye candies of investors. Couple of quick examples can be UiPath and Automation Anywhere. While the former raised its value to $3 billion through Series C funding in September 2018, the latter gained $300 million from SoftBank Vision Fund in November 2018 to climb up to $2.6 billion value. With such an influx of investments, the process automation market companies are employing the cumulative capital for the development of various automation equipment, and the market for the same is flourishing. 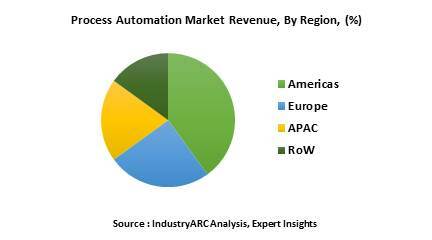 As per the findings of this IndustryARC report, the global process automation market size was at $65 billion in FY 2018. And, the demand is increasing at a progressive CAGR of 7% during the forecast period of 2019 to 2025. Although process automation market is flourishing throughout the world, the Asia-Pacific region has managed to grab the largest demand share of around 30% to 35% as of 2018. According to the IndustryARC market research report, the pharmaceutical sector is the key end-use industry where process automation is flourishing. The process automation market in the pharmaceutical industry projected to grow at a relatively higher CAGR of 8% during the aforementioned forecast period. The aim to limit human interaction to achieve optimum accuracy has emerged as the prime reason for the process automation market growth. Technologies such as distributed control systems (DCS), manufacturing execution system (MES), local area network (LAN), remote terminal units (RTUs), programmable logic controller (PLC) and most importantly supervisory control and data acquisition (SCADA) are the leading aspects for the process automation market. Process automation plays an important role in business process management (BPM) and enterprise resource planning (ERP). Industrial automation or factory automation are some of the most prolific growth drivers of the process automation market. The emerging requirement for reducing human interaction in various processes in order to cut down labor costs as well as minimize errors has opened a room full of opportunities for automated systems in the industrial sector. The imminent need for achieving the best possible results concerning accuracy is also one of the growth drivers for the process automation market. Various automation equipment installed in multiple industries such as pharmaceutical, electrical, manufacturing, and other sectors has achieved prominent results which are much more precise than the human implied operations. Technical giant Intel acquired Itseez Inc and Yogitech to bolster its automotive IoT profile. Furthermore, Microsoft acquired Italy originated company Solair, and Cisco acquired the start-up from California named Jasper for $1.4 billion. Evidently, acquisitions are in full force, showcasing major companies’ zest to stay ahead of the curve. Process automation is estimated to reduce a significant amount of jobs for the regional population. Process automation in areas with industrial based employment will replace the man-force with automated equipment, which further will lead to unemployment among the people. This leap could affect the regional inhabitants at a massive scale. Incorporating process automation in the manufacturing chain sometimes requires building high-level algorithms, and these algorithms are programmed to target a specific dataset. If there comes a data gap in the agile development process or automation, it could lead to an ambiguous process or development. With a great wave of start-ups emerging in the process automation market, some of the dominating key players are :- Mitsubishi Corporation, Robert Bosch GmBH, ABB Ltd, Eaton Corporation, Dassault Systems, Emerson Electric Co., Honeywell International, Inc., Johnson Controls, Inc., Rockwell Automation, Inc., and Schneider Electric SE. The base year of the study is 2018, with forecast done up to 2025. The study presents a thorough analysis of the competitive landscape, taking into account the market shares of the leading companies. It also provides information on unit shipments. These provide the key market participants with the necessary business intelligence and help them understand the future of the Process automation market. The assessment includes the forecast, an overview of the competitive structure, the market shares of the competitors, as well as the market trends, market demands, market drivers, market challenges, and product analysis. The market drivers and restraints have been assessed to fathom their impact over the forecast period. This report further identifies the key opportunities for growth while also detailing the key challenges and possible threats. The key areas of focus include the types of Process automation market, and their specific applications in different types of vehicles.